If the Frequently Asked Questions section below does not answer your question, please use the form on the "Contact" page and I will get back to you promptly. I can’t login. I forgot my password. If you are new to the site, you must register as a free member and activate your account before you will be allowed to log in. Check your email for a message with the Subject: "Activate your new account at Mary May's School of Traditional Woodcarving"
Be aware that this message sometimes shows up in spam folders. Open that email and click the link inside. Once that it is done, you will be able to log in. You will also receive other "Welcome" emails that offer tips on getting started. Follow these instructions for resetting your password. Click this "Lost Password" link, or the one at the bottom of the login panel. Answer the next question with your email address. "Recover your password at Mary May's School of Traditional Woodcarving"
Be aware that this message sometimes shows up in spam folders. It usually arrives within a few minutes. Open that email and click the link in the email. You will be taken to a password reset page and shown a "suggested" password. The one they provide will be almost impossible to type, and I suggest typing over that with your preferred password. If you want to use the one they provide, copy and paste and save it someplace that's safe. There are helpful password hints here. You can now log in with your new password. If you don’t remember your username, contact me using the Contact form and I can help you with this. You also have the option of logging in using your email address in place of your username. You're here because videos aren't playing properly, or maybe not at all. Bob Easton here as technical support for Mary May's web sites. I've been helping people with videos for years, and I can assure you that the problem is NOT you or anything you are doing wrong. The problems are inevitably, 99.44% of the time, due to either a slow network connection or the web browser you are using. First, is this a new problem for you? Did videos used to play and are now giving you problems? If yes, what has changed with your computer or your network connection? Have you changed your internet service provider? What else might have changed? We haven't changed. We're still doing videos the same for over two years. We use a very reliable video service provider, Vimeo. Vimeo has delivery points all over the world and packages our videos in several sizes (resolutions) to be sure they play on as many networks and devices as possible. Next, let's check network speed. Do videos stop and start, run in spurts? That's usually an indicator of either slow internet connectivity, or something else very busy at your location. If you hit the pause button on the video and let the progress bar fill up some more, does the problem get better? That's another sure indicator of a slow internet connection. If any of this sounds familiar, try a speed test. 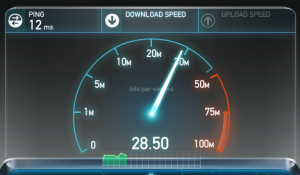 Go to speedtest.net and run the test. Make note of the "Download speed." A download speed of 6 Mbps or higher is usually sufficient for our videos. If your results are slower, consult your internet service provider to see what you should be receiving. Maybe there's a poor connector somewhere? What else can you do about a slow internet connection? Use our download service. We offer downloads precisely for the case where people have slow connections and no options to upgrade to faster ones. What if the videos don't play at all? Try this, a very simple test. Try playing this video (opens in a new window/tab). It is served directly from our video service provider with none of the school site involved. If that video doesn't play, you almost certainly have a web browser problem. If you are able, that is if you know how, try a different browser. Try Google Chrome (my first choice) from here. Or, try Firefox, another very good choice from here. NOTE WELL: You do NOT need Flash or Java to play our videos. We use modern, industry standard, HTML5 & MP4 format that does not depend on either Flash or Java. FWIW, Internet Explorer has been more troublesome than any other browser! IE has more "features" and "protections" than any nagging nanny I know. Some settings get changed without you even noticing, and when I ask "What changed?," you have no idea that something inside Internet Explorer changed. Recent releases, 9, 10, 11... have attempted to resolve internal problems from years ago and are changing things we don't even know about.Every new version of Internet Explorer breaks some things for some people. This breakage doesn't happen nearly as frequently with other browsers. This is why switching from Internet Explorer to almost any other browser mysteriously resolves video playback problems. A Google search for "internet explorer won't play videos" gets over 1,680,000 results. To me that says "Run away!" Lastly, there may be something else on your home network that's interfering. Do you have lots of browser tabs open? Every browser tab needs cycles and memory. Even when you are not looking at them, they are consuming computer resources, sometimes enough to keep videos from playing. Are there a lot of people using many computers to watch videos and stream music ... all on your one and only internet connection? That might be siphoning off bandwidth needed for the video you want to watch. P.S. What if this was too technical for you? Surely, there's someone in your family who is good with computers. Invite them over for pie and coffee and show them the problem ... and this page. It's worked time and time again. P.P.S. If you decide to contact us, please provide information about the speed of your network connection, the kind of device you are using (desktop, laptop, tablet, phone), and the browser you are using. Please, please, please (yeah, I'm begging you) provide as much detail as you can. "Doesn't work" is not detailed enough for me to be able help you. A member of this site discovered that having "Private Browsing" turned on will prevent most video lessons from playing. Something to check. You'll find the switch in Settings > Safari > Privacy. Turn it off to gain access to subscriber videos. Otherwise, as long as you have good connectivity (sufficient bandwidth), videos should easily play on iPads. If your connection is constrained (weak WiFi, or old DSL service) downloading is a good alternative. If you have no connectivity in your workshop and want to use the videos there (who doesn't?) downloading is a must. Downloading is most reliably done using iTunes to sync videos to your iPad. It takes several steps and looks complicated, but once you learn, it is relatively easy. A subscriber suggested the following, but was very humble in asking not to be identified. We sincerely appreciate the contribution, edited here to include a few click paths. Different versions of iTunes show various ways to accomplish these tasks and the notes in parentheses might not exactly match your version. Download the videos to some logical folder on your PC / Mac. Be aware: Before you sync, check the videos which you want synced. If you uncheck them, they won't sync the next time and will be removed from the iPad. The sync really is a sync, not a onetime download. The videos then show up on iPad under the Videos app. From there they play naturally. Take the iPad to the shop and do some carving. Playback on Apple TV requires syncing via iTunes. The process is similar to that described above for syncing to an iPad. Download, add to library, and sync to the Apple TV. Your internet address (IP) when the problems were happening. Hint: use this link to find your IP address. Send those details directly to me. How do I download videos to watch them off-line? All lessons are available for download to Monthly and Full Year Premium Members. Go to the page where you can watch the episode. Below the video there is an option to download different sizes of video. Simply follow the instructions, save the lessons to your computer or tablet and watch the lessons anywhere off-line. Two ways. The easiest is to (1) Be sure you are logged in and then, (2) use the “Cancel” button below. An alternative, which takes a few more clicks, is to visit your PayPal account page, find the membership, open it, and cancel it. FREE – All memberships begin with a FREE level that gives you viewing access to all videos in the Beginning Carving Projects category. 1 Week Member – This level offers a way to view all content for 7 days. It has a one-time payment that expires at the end of a week, reverting back to the FREE membership level. Monthly Member – This level offers viewing and download access to all videos. It is billed via a PayPal recurring membership and continues for as long as you maintain payments. Full Year Member – This level offers the same viewing and download rights as the monthly membership, but at a discounted price. It has a one time payment, expires after a full year, and reverts back to FREE membership at the end. See the My Account page to start your membership or to upgrade from a FREE membership. Our current monthly membership is a recurring monthly membership. It continues until you cancel it. We also have “one time” purchase options that provide either one week of access or one full year of access. How are memberships paid? PayPal? Credit Card? Check? We use PayPal as our payment gateway. PayPal works differently depending on what you purchase. 1 Week Member: This is a ONE-TIME purchase and can be made with or without a PayPal account. See the next question for more detail about how to make a credit card payment without a PayPal account. Monthly Member:: This choice requires a PayPal account. PayPal establishes a recurring membership and takes payments from whatever payment method you establish for your PayPal account: credit card, banking account withdrawal, etc. Full Year Member: This is a ONE-TIME purchase and can be made with or without a PayPal account. See the next question for more detail about how to make a credit card payment without a PayPal account. Mary also accepts checks for this purchase. Please use the Contact form to inquire about details. What if I don’t have or don’t want a PayPal account? How can I determine how much time is left on my membership? After logging in, go to your Member Home Page by clicking on "Members" in the top menu. Your expiration date will be listed near the top of this page. What ‘one time’ purchase options are available? We currently offer one time purchases for two durations. The one week option is good for the person wanting to evaluate the advanced lessons before committing to a longer purchase, and for people who are constrained by time or budget. The full year option is for those who intend to stay with us and are interested in saving a month’s fee. See the Welcome page to start your membership or to upgrade from a FREE membership. No. Due to the short billing periods and relatively low cost, we do not offer refunds for cancelled memberships. If you cancel before the end of a billing period, your access to this site will continue for the remainder of the period most recently paid for. If you believe you have made a technical error while subscribing (such as subscribing twice), let us know via the Contact page. I teach basic, intermediate, and advanced carving classes in various woodworking venues around the United States and Europe. Classes run from 2 days to a week in length. Consult my CLASSES schedule for upcoming dates and locations. If you're wondering what tools to bring, details for each class include a tool list. Of course, you're welcome to bring as many as you can carry. Everyone has their own ways of learning. I know that some people might not want a full subscription with so many projects, but might want to work one project at a time. If that is your learning preference, Individual Lessons are for you. Most of the lessons, beyond the Beginning Projects category, have Individual Lessons that can be purchased separately. If a lesson is available for purchase, the Introduction page for the lesson features a "Buy This Lesson" button prominently in the upper right corner. Press that button to buy. All lessons are sold through a marketplace that accepts credit card payments and handles all of the download process for you. You can find a full list of all Individual Lessons via the link in the footer of the website, or through this link. I promise that if you join the school or one of my mailing lists I will never sell, publish, or give away your information. Additionally, I encourage you to UNSUBSCRIBE from any of my lists when you no longer find them valuable. There is an UNSUBSCRIBE link near the bottom of each mailing. Yes. I collect only your name and email address, and I do not distribute that to anyone else. I do not collect your credit card information, or any other financial information. I use a trusted vendor, PayPal, for payment functions so that I never have to see your credit card or other financial information. Since I don’t collect your financial information, I can’t expose it to anyone else. How do you use the information you collect about members? Your information is used only to maintain a subscription at my school site, or membership for newsletters. I do not sell, publish, or distribute information about you to anyone else. I do distribute periodic newsletters, but you can opt out of those by using the “unsubscribe” link at the bottom of the newsletter.